My Little Pony Projects. Yes, customised MLP! My Little Pony. Sure you know it! Making a customised pony? Oh yeah. ...It's a whole sub-culture out there people, do try & keep up. Just the beginning of pages of results of Google image search for "MLP customise"
See, as I'm a model-maker/sculptor at heart, this project was an irresistible lure as I found myself embroiled in Pony-world via two unexpected sources. Commander Hurricane The Great. 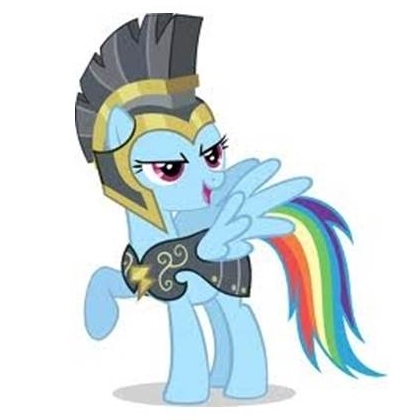 My friend's official avatar at Bronies Australia. How it started: a very beautiful 10 year old fellow of my close personal acquaintance is rather taken with this dream within a dream, the magical friendship of MLP. 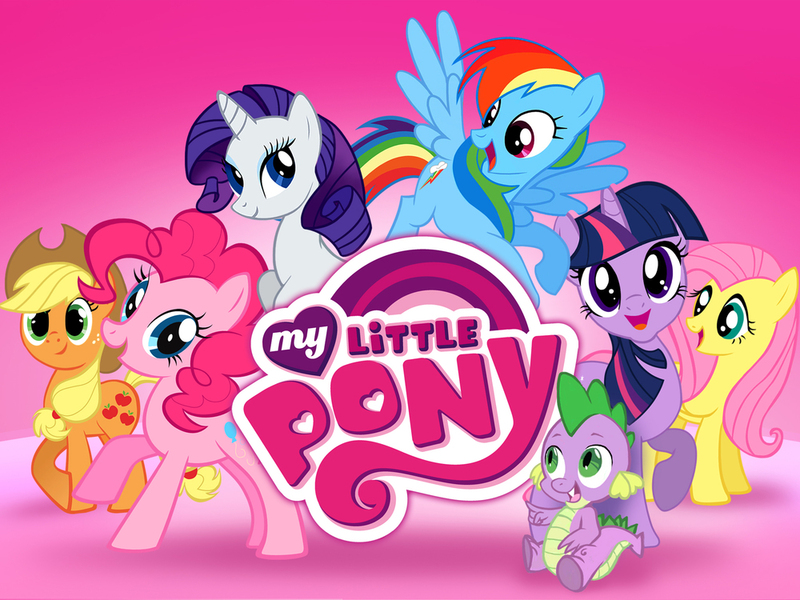 He's a self-confessed "Bronie": a male fan of a show once characterised as just a little girl thang. Well it's not, it turns out it's for the fellas too you know, the ten year old variety of which I happen to live with. And it's a subject of great study around here. Trust me, do not get between a Brony and it's Pony. So I have an vested interest in Ponies, indeed, in all of Equestria all the way to Canterlot. 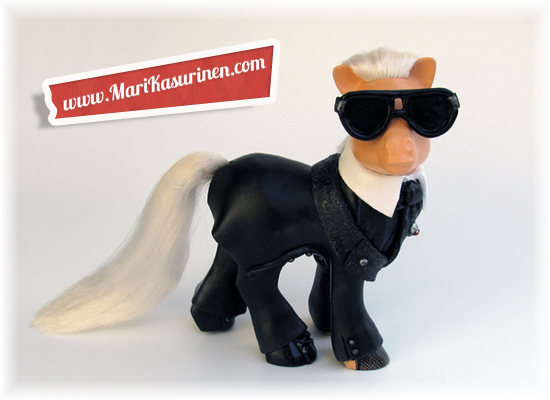 "My Little Karl Largerfeld"by Mari Kasurinen. Image used here with the permission of the artist. I contacted Mari via the form on her site, asking nicely if she's please consider making some ponies for me & that I had a couple of characters in mind. And she's so nice! She replied that she'd recently become represented by Galerie Gmurzynska, Switzerland and that although she'd be happy to undertake the commissions herself, she was now in the gallery's hands and that they would be in touch. She's so nice! Alas however, I never did hear from her or them again. Never mind. But I couldn't stop thinking about my pony characters and there was no waning of pony enthusiasm going on around me; after several months of denial, I thought I'd have a go at making them myself. And so I did! Behold: *My Little Artworker Pony, *My Little Bob Dylan Pony & *My Little I M Pei Pony. *MLAP, MLBD, MYIMP, by abbreviation. 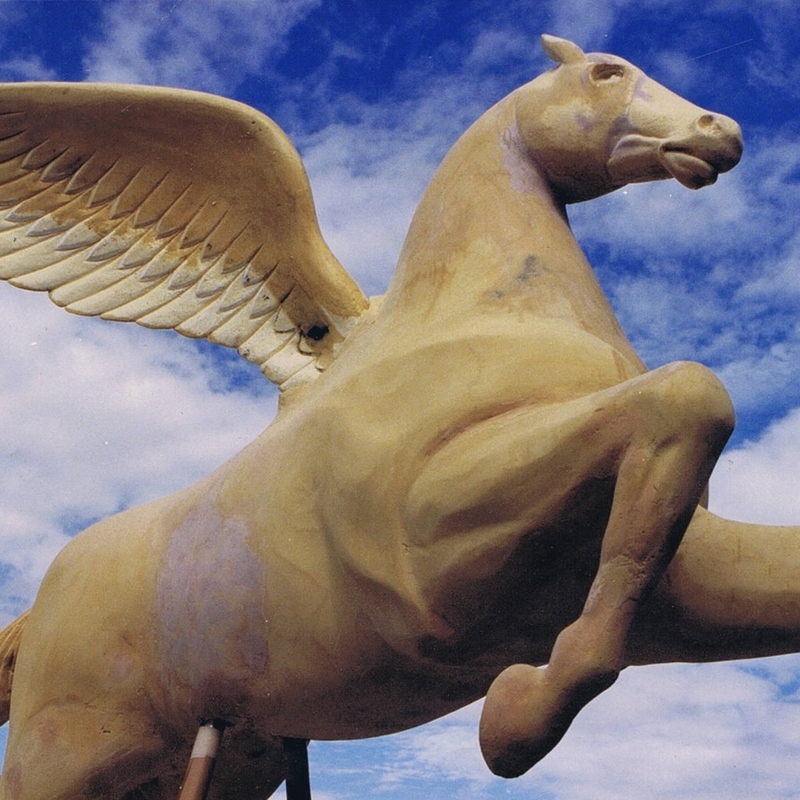 The above images show the making of "Tenma", the winged Japanese horse which perched atop a building on the Gold Coast in Queensland Australia for many years, a long time ago. It was pretty big. But that's another story entirely and a shameless bit of self-aggrandisement. Back to ponies! One of the things I so admire about Mari Kasurinen's work is the absolutely seamless finish she produces. Just like a factory made, which is essential to the intent. And me, a recovering perfectionist, it's painful for me to accept any less than that too. But alas, mine are only sort-of OK, not marvelous like Mari's, may she live long and prosper and make many more excellent artworks. But I had a lot of fun with this project. The research for the characters was particularly fun, and the practicalities of the making was enlightening; believe me, there is much and more to this MLP sub-culture and a lot of really nice, helpful people. I found this site helpful, with tips, tutorials, detailed info & advice. It's one of the best features of webworld, knowledge sharing and I'm grateful for what I learn - respect, people. 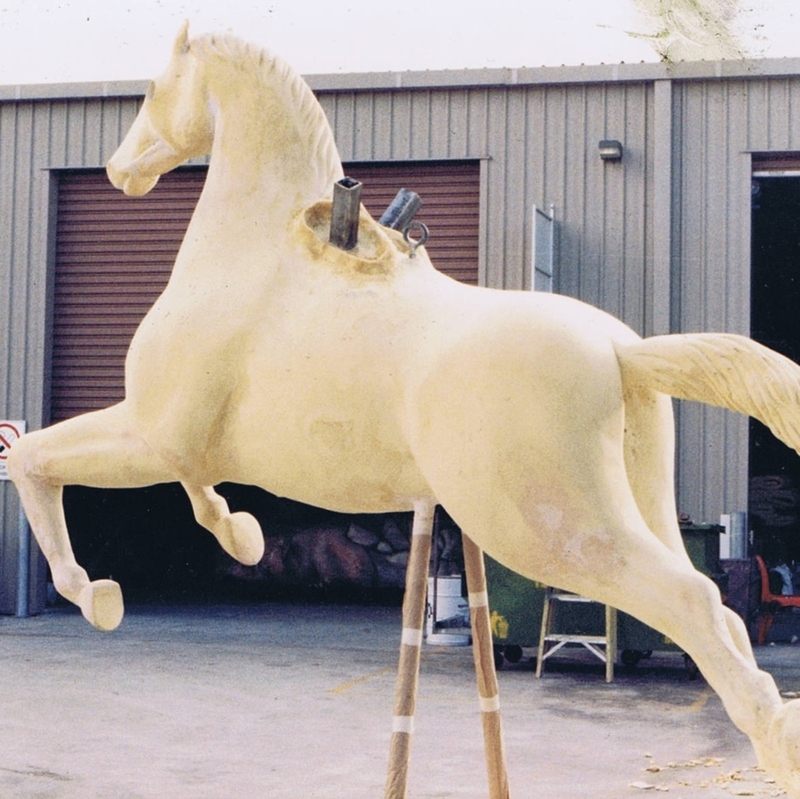 I learnt from my hours study that to begin with, a pony customiser started with a "Bait Pony"! In other words, raw material; I found a large box full of them on eBay, straight away, very cheaply and locally, and then I was away. After a clean, I cut off their hair, not pulled it out as recommended. This was my first step away from puritan perfection and to be honest, from here on I just got on with it, accepting that I'd make my ponies 'good enough', not perfect. Yes, such an admission hurts me too. But pulling out hair from the little plugs inside that teeny head and then replacing it the same way? Please, no! I resolved that I would forge ahead my way, and singed off the stubble with a flame, knowing that I'd somehow fix new hair right on top. Bait Ponies. I scalped ém. Once I'd done this, I gave them a really thorough scrub with detergent and left for a day or more to totally dry out. Next, I painted everything flesh colour, all over except for the eyes, just to establish a baseline away from the pink & blue which was very distracting. All the advice I'd gleaned from related sites & blogs had assured me that artists acrylic would be fine to use, and so it was. Then it was time to do a bit of modeling of the features and adding of costumes. Enter Super Sculpey. I admit this was my first experience of it but it was pretty agreeable to work with and takes detail really really well. Mostly it was fingers and *simple wooden modeling tools. I have a collection of modelling tools, some very old friends there, as well as a few steel files and rifflers that were handy. 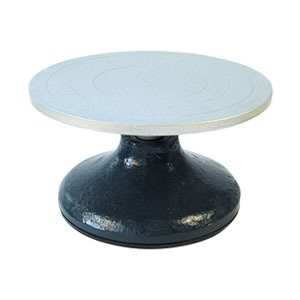 The other helper, trust me on this, is a decent *steel turning wheel. I wish I had one! 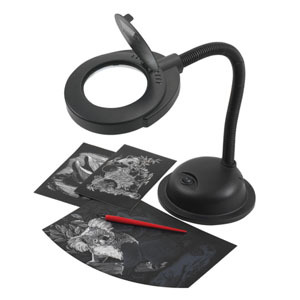 Also, it would have been fantastic to have a *desktop magnifier. That would've really helped, good grief. On my wish list anyway. Really, I just kept mucking around until it was nearly good enough, planning on much more finishing after hardening. But with this, there was a great deal of mucking around. Much better to do as much as possible before baking, in hindsight. * All available here at Eckersleys or click on the images below. Because it turned out, Super Sculpey bakes really hard, like, really hard. and there were layers of reapplying more over already hardened layers, modelling them, hardening, sanding and filing... a few times over and in such minute layers...heavens above. Times like these, one is glad of a Dremel, one of the handiest tools in the business. There was A LOT of sanding. I did read of a Sculpey Dilutant in one of the forums, for attaching new raw bits of Sculpey to baked surfaces but I didn't use this and as far as I can tell, the areas I added extra to seem to have bonded fine. So far! Below, two snippets of info regarding successful baking of Sculpey. There are a few forums around the Intermerweb, if one goes looking; again, there is no substitute for experience, but I love it when people are generous enough to share theirs. I followed this advice and they were spot on. From Shiflett Brothers Sculpting topic discussion, proper baking of Super Sculpey. "The Shiflett Brothers are living their dream. 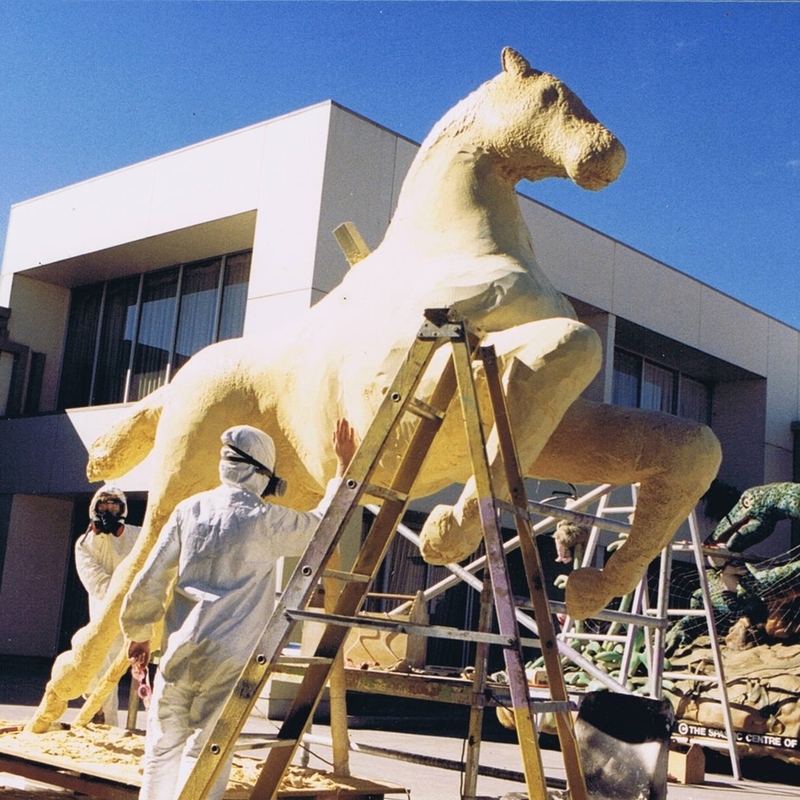 Comic book geeks turned industry sculptors (but, alas, remaining comic book geeks)." This is from a great forum, RPF. "The RPF is a privately run website, owned by Movie Prop Sites, LLC, that hosts a public message board dedicated to providing fans of movie props, movie wardrobe, and other movie related memorabilia with a place to interact. But the RPF is more than a discussion forum, it is a community. Our members include collectors, artists, hobbyists, professionals, and those interested in replica as well as original movie props and wardrobe. Since the late 1990's, this community's members have shared their creations and collections with the world, joined together in research and discoveries and in many cases, formed lasting friendships." I also found I needed to whack a layer of base colour paint on, after each baking, befor adding or subtracting material, just so I could see the surface better; SS is translucent and deceptive to judge after a while. I did read somewhere that it's helpful to mix a bit of grey Sculpey (called "Firm") in with the Super, for this reason. An opaque surface shows more easily where faults in the surface lie and where amendments are needed. But eventually...I couldn't bear to do yet another teeny layer here or more sanding everywhere and I had to call an end to this part of the project. I hate it when I have to admit it's good enough. Ouch! Heavy sigh. But once I had the shape of the pony & the apparel right, there was some fun stuff to come with the painting and accessorizing! I'll take you through the development of the character personas individually I think, otherwise I'll be jumping from one to the next, as I do when I'm working, but that may be hard to follow here. For My Little Artworker Pony, click here. For My Little Bob Dylan, click here. For My Little I. M. Pei, click here.